Baseball: Buy me some peanuts and... coffee?? I was at the SF Giants game the other night (not the important night - one night too early, drat) with some friends for my old roommate Colin's 30 Games for 30k summer baseball tour to benefit the Leukemia & Lymphoma Society. We enjoyed the traditional ballpark fare of beer, popcorn, and garlic fries, some of which was barked and sold by bleecher-walking vendors. But then, three people waaay over from us on our row ordered coffee. 1. First cup of coffee. 2. Second cup of coffee. 3. Seriously, a third cup of coffee? Something feels ridiculous about this. There's been plenty of snickering commentary about the state of our I'll-have-it-my-way coffee shops, but I tend to want to let people have their choice - unless and until I'm the one delivering all of those options. 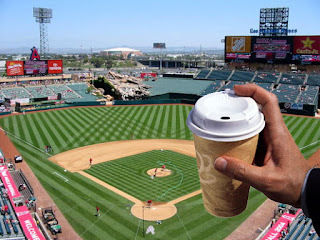 This is especially true at a baseball game, where I have some vague notion of a one-size-fits-all Americana that is rudely ruptured by such customized coffee. Let us all watch the game - and just order a beer!